Lesbian, Gay, Bisexual, and Transgender (LGBT) seniors have unique needs and face unique challenges. A perceived lack of resources and understanding among Senior Care Providers can be very frustrating for LGBT seniors, in many cases forcing them to conceal who they are, often leading to a decrease in their quality of life. Our meetings are open to any and all who share our goals. Please see our events calendar for our next scheduled monthly meeting, with guest speakers discussing a wide array of topics focusing on LGBT elders today and tomorrow. Mitchell C. Hunter will be our April 26 Speaker "Call Me by My Name: Respecting Our Trans Elders." Mitchell C Hunter is an activist leader in the Transgender (Trans*)/NonBinary (NB) and LGBQ communities. Serving on Seattle’s LGBT Commission, he jointly created Seattle’s all-gender restroom law. Mitch collaborated on the SPD’s model transgender policy and is featured in their mandatory training video https://youtu.be/q1WYzkfCR_I. For Komen Puget Sound, he trained more than 600 area healthcare providers and staff at clinics, and area hospitals on trans/nb-inclusive policies and best practices. Mitch works with corporations; health care facilities, clinics and hospitals; institutions; faith communities and organizations to further transgender inclusivity, visibility, leadership, and policies/procedures that humanize. Hazel Thornton, Snohomish Outreach Coordinator, Washington State Chapter, Alzheimer's Association, will be our May 24, 2019 Speaker. 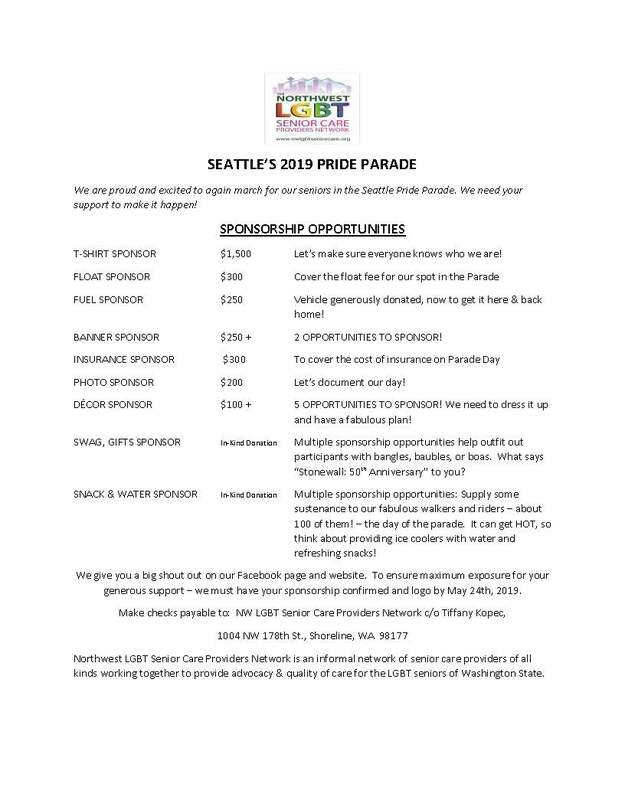 To provide education and support for the LGBT senior community when navigating through the health care continuum, while ensuring that their dignity and individual choices are respected and honored. Educating - Providing education through action by being positive role models and contributing members of the community at large. Supporting - Connecting LGBT seniors to the resources they need to make informed decisions. Respecting - Honoring them as the unique individuals that they are while also respecting their family of choice. Collaborating - Working with their family of choice and their support network to facilitate their ability to actively participate in the decision making. Empowering - Supporting their-self actualization by reinforcing the belief that every human being has the inherent right to be whom and what they want to be. Advocating - Under the umbrella of our coalition, we want to provide resources, community outreach and volunteer opportunities for our members. Sign Up for Email Alerts About Network Events! Contact Tiffany Kopec, 206-714-6130, tkopec@homecareassistance.com with questions. "This agency certifies that it does not discriminate in regard to race, color, gender, gender identity, gender expression, marital status, sexual orientation, political ideology, age, creed, religion, heritage, ancestry, national origin, or sensory, mental or physical ability. Note: Organizations that provide housing services must include sexual orientation and gender expression/identity as part of their fair housing non-discrimination policy when publicizing information about their company, including languages other than English. Note: Organizations may target services to a specific population when targeted groups require specialized programs to meet specific needs not shared by the general population. Additionally, an organization may provide targeted programs or services to redress current or past discrimination against a group."